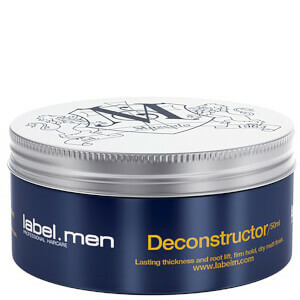 The Deconstructor from label.men is a versatile, matte-textured product to uplift roots for a long lasting, fuller look. Mould, sculpt and experiment to create your desired hair style with a firm hold and a dry matte finish. Suitable for all hair types, it can be used to boost volume and add thickness to hair. E.N. Directions for use: Evenly distribute the Deconstructor paste throughout the hair using fingertips. Apply the required amount of product for your desired level of hold.